Meeting clients face-to-face isn't only for those who do business locally. As we work in an industry in which a lunch meeting or a quick coffee break with a direct client can be difficult, given geographic constraints, we should not use this excuse to simply correspond with clients via email all the time. In fact, we should all make a point to "meet" new clients, even if they never end up signing on the dotted line. By taking the time to meet your potential direct clients, you're able to prove your professionalism, allow them to get a feel for what it's like to work with you from the start, and uncover goals they have that you can assist them in reaching. The next time a potential direct client requests a quote via email or a form on your website, refrain from sending the quote back to them immediately via email. Sometimes we rush to do this only to hear crickets afterwards. 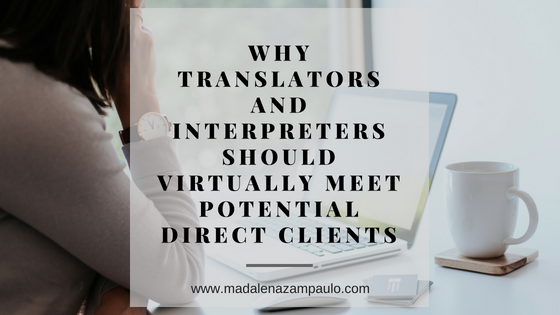 Remember, direct clients are usually in less of a hurry than translation agency clients, so you have some time to make a good first impression! Send the client a link to your Google, Calendly, Apple, etc. calendar, and have them choose a 15- to 30-minute time slot to meet with you virtually or by phone. Schedule the meeting via a platform like Skype, FaceTime or Zoom, and set up a time to talk about their needs, goals and the why behind the translation or interpretation request. This will allow you to uncover much more about them than you could in a quick set of back-and-forth emails. It also gives you space to talk about the value you bring to the table rather than simply corresponding about price. After all, competing on price will get us nowhere fast! Once you have the meeting time set up, take a half hour to research the client online. Look carefully at their website. Research news stories or press releases about them. Peruse their social media channels. Take a look at the LinkedIn profile of the person who reached out to you. Find out anything and everything you can about the size of their business, their goals, new ventures, etc. Just by doing some homework ahead of time, you may find that you can help a new client in ways they aren't even inquiring about… yet. For example, do they have a poorly translated website? Are they using a Google Translate button as a crutch instead of having a professional translate the key areas of the site that could help them reach a new market? When you finally meet with the potential client, you can ask them key questions in addition to the typical questions you'd ask of a client. Make sure you cover topics that will help you uncover more information that allows you to better articulate your value. Here are a few questions to get you started. ○ What has your previous experience been with translation or interpreting? ○ What is the goal you want to achieve by having this document professionally translated/this meeting professionally interpreted? ○ What are the characteristics you are looking for in a professional translator/interpreter? ○ What would this translation/interpretation do for you? What problem(s) would it help solve? ○ If we were to meet a year from now over coffee, what would you like to be telling me about this project or the goals you had a year ago? By meeting with someone to find out more about the why behind their request, you are able to truly nail down the actual value you bring to the table as a trusted colleague and team player. This information is priceless and can be used moving forward with other clients as well. Having this knowledge can help you set your price with the client, because you know that you are providing a service that enables them to reach a goal, and that helps them to achieve more. Without you, they might not be able to do so. When you meet your clients online (virtually), you are able to put a face to a name and professional. You are also more likely to win a new client's trust, as they will now know who you are and will be more likely to want to engage with you. People like to do business with those they like and trust. If meeting a client in a virtual session makes you sweat, at least set up a proper phone call with your potential clients before you send back a quote. Otherwise, you'll just be like every other translator or interpreter out there who shoots off rapid-fire quotes based on a generic rate sheet. All this allows you to do is compete on price, and that is the last thing you want to do. Make a lasting impression, and give your client the courtesy of getting to know (and trust) you.